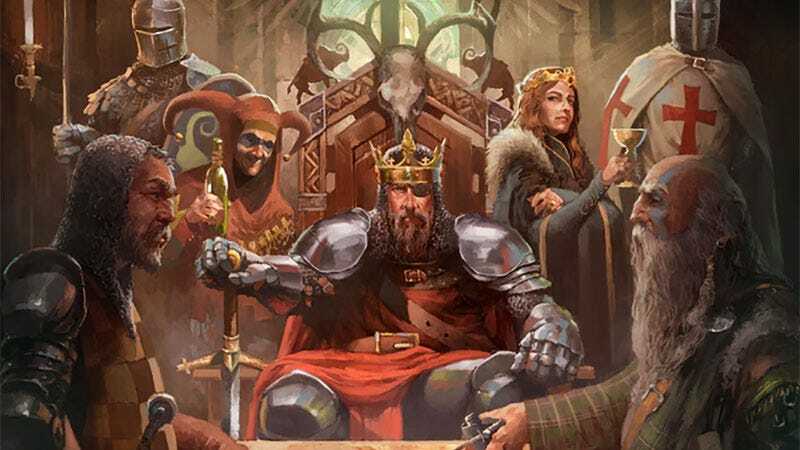 Crusader Kings II, a sprawling PC game with around 17,534 buttons and menus, is coming to tabletops, and has been condensed so much that it’ll be playable in 2-3 hours. Not that this is a bad thing! If I want to spend dozens of hours managing an empire I’ve got the video game for that. The board game is more intent on taking the absolute core elements of CKII—politics, marriage, intrigue and warfare—and turning them into something you and some friends can play in a single session. ...dynasties struggle for control of the provinces on the game board. This province control is indicated by the detailed knight figures that come with the game. In order to be successful, you need to manage the traits of your royal family, find the right spouse to marry, get rid of unwanted heirs to your throne, develop your domain, make and break alliances with other players, plot, invade and crusade, all the while experiencing events of the life of a medieval ruler. That’s a lot of stuff to break down into something that’s manageable on a table in one night, so I’m keen to see how it plays out when the game is released towards the end of this year. Note that CKII is just the first board game Paradox are branching out with. There are also tabletop editions of Cities Skylines, Europa Universalis and Hearts of Iron planned as well. The game can be ordered on Kickstarter.